In this paper we show, by generalizing Hermite’s theorem to the multivariate setting, how to count the number of real or complex points of a discrete algebraic set which lie within some algebraic constraint region. 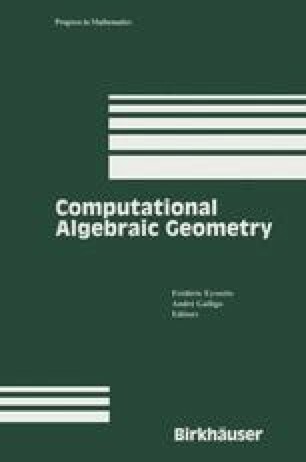 We introduce a family of quadratic forms determined by the algebraic constraints and defined in terms of the trace from the coordinate ring of the variety to the ground field, and we show that the rank and signature of these forms are sufficient to determine the number of real points lying within a constraint region. In all cases we count geometric points, which is to say, we count points without multiplicity. The theoretical results on these quadratic forms are more or less classical, but forgotten too, and can be found also in . We insist on effectivity of the computation and complexity analysis: we show how to calculate the trace and signature using Gröbner bases, and we show how the information provided by the individual quadratic forms may be combined to determine the number of real points satisfying a conjunction of constraints. The complexity of the computation is polynomial in the dimension as a vector space of the quotient ring associated to the defining equations. In terms of the number of variables, the complexity of the computation is singly exponential. The algorithm is well parallelizable. We conclude the paper by applying our machinery to the problem of effectively calculating the Euler characteristic of a smooth hypersurface.